This week on New Mexico in Focus, host Gene Grant sits down with current provost and former president of the University of New Mexico Chaouki Abdallah. He is leaving his 30-year career at UNM to take a position at his alma mater, Georgia Tech. Abdallah spoke about his time as a Lobo and how he thinks the university can continue to improve access to higher education for students from all backgrounds. Producer Sarah Gustavus talks with Greg Williams, an Albuquerque attorney who specializes in open government cases and whose son, an incoming freshman, intended to play soccer during his time at UNM. 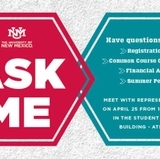 Men’s soccer, however, was one of four sports the UNM Board of Regents voted last month to cut for financial reasons. At least two complaints have been filed against the regents alleging they violated the state Open Meetings Act. Williams stopped by this week to share his personal and professional reactions to the regents’ decision.